Here you have an opportunity to learn from two of the ITIL 4 architects – and THE best ITSM trainers in the industry – Troy DuMoulin and Robin Hysick! Register for the ITIL 4 Foundation course in Toronto or Philadelphia and save 25% by using the promo code: ITIL4VIP at checkout. These are two of the very few classroom courses being scheduled in the near future – book your spot before these classrooms are full! Offer ends January 31, 2019. Take a look at our blog posts which offer insights into ITIL 4. The Wait Is Over – ITIL 4 Course Dates Are Here! Pink’s first round of dates for the ITIL 4 Foundation certification course are here! Register now for a special launch price of $899 USD / $999 CAD (including the exam). This offer ends December 31, 2018. Bring us on-site for the certification course. We have a VERY, VERY special ITIL 4 launch offer 4 you! Contact us at info@pinkelephant.com or 1‑888‑273‑PINK. Get An ITIL 4 Overview! What’s new in ITIL 4 – we’ll give you all the details! Bring us on-site to deliver an ITIL 4 Overview for your entire team – we have special pricing for that too! Contact us at info@pinkelephant.com or 1-888-273-PINK. 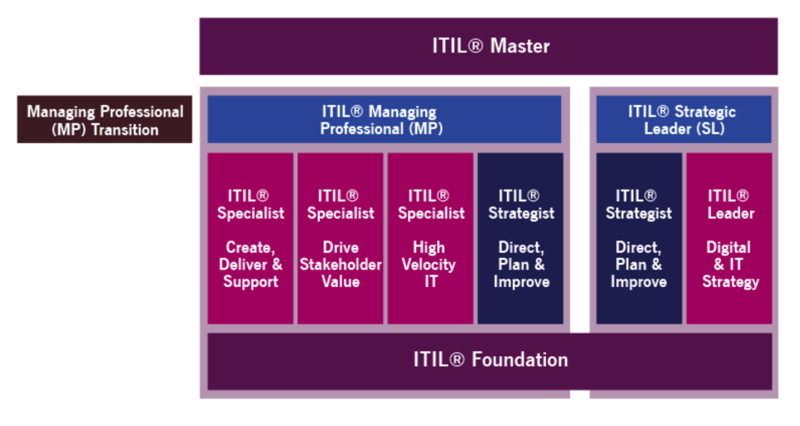 Here It Is – The New ITIL 4 Certification Path! Just announced from AXELOS – the above diagram depicts the new certification scheme. The ITIL 4 Foundation Certification Course will be available in early 2019 and will include the Core Guidance – Fundamentals Book. Additional ITIL 4 publications will be available late 2019. What If You're Already ITIL v3 Certified? If you are currently ITIL v3 certified, there will be a transition plan available to upgrade your existing certifications. More details to come. What Is In The ITIL 4 Content? ITIL 4 builds on what you already know. ITIL 4 expands on the previous versions by providing a practical and flexible basis to support organizations on their journey to the new world of digital transformation. It provides an end-to-end IT/digital operating model for the delivery and operation of tech-enabled products and services and enables IT teams to continue to play a crucial role in a wider business strategy. ITIL 4 also provides a holistic end-to-end picture that integrates frameworks such as Lean IT, Agile and DevOps. Don’t forget, you can register with us and be one of the first IT professionals on the planet to be ITIL 4 educated and certified! Act fast – space is limited, so if you’re interested, let us know and we’ll put you on the list. This is the first in a series of updates to keep you in-the-know about the new ITIL release. It’s time for another edition of the world’s favorite IT service management best practice framework. First released in 1989, ITIL was republished in a new format in 2000, updated in 2007 (with a slight refresh in 2011), and here we are in 2018 with ITIL 4 on the starting blocks! AXELOS (the owner of ITIL) has now gone public with the news that the "ITIL update" will be called – "ITIL 4"! The current version is called ITIL v3 – no big surprise that the new name is ITIL 4. Although, make note of the subtlety – it's not ITIL v4 but ITIL 4. ITIL 4 is set to be released in early 2019, and Pink has played a major and key role in developing this new release! While still retaining the best of ITIL v3, and with most of the operational and tactical practices and processes you are so familiar with in ITIL v3 still going to be there, the new release also includes focus on integrating many best practice frameworks. All good news – and long overdue! Having seen the content ourselves, there are some very exciting inclusions. ITIL 4 contains many of the same processes that are part of ITIL v3, but there is now a much-needed (we think!) view of integrated service management, which means the ITIL body of knowledge now brings into the fold DevOps, Lean, IT leadership principles and Organizational Change Management. At Pink, we've been working under an NDA with AXELOS for some time to help chart out what should be in this new version, and how it will be presented to the public at large. But that's not to say this is a new body of knowledge created by an elitist group. On the contrary! AXELOS has sought input from many hundreds of people in all corners of the globe with the question "What would you like to see in an updated ITIL?" Hey – What About My v3 Certification? The good news is ITIL v3 training and certification is not going to waste. We expect the next announcement from AXELOS will confirm details of how you can go about upgrading your ITIL v3 knowledge to embrace what’s new in ITIL 4 – should you choose to do so. If you have ITIL v3 certifications, or are undergoing or planning to take ITIL training and certification in the coming months, keep it going! ITIL 4 will continue to recognize ITIL v3 certifications because, as stated above, a lot of v3 content is being retained. Of course, where appropriate, we can expect new and updated training and certification products to be introduced, and this will be done in practical ways to help you consolidate your existing knowledge with the new practices. There’s only so much we can say right now (because this work is still ongoing) except that we know the new path to “ITIL Expert” will be simpler and more efficient. Again, the good news is that the money and time you’ve invested so far in building up your ITIL knowledge over the years is still very meaningful and worthwhile. As a global partner, we’ve been working with AXELOS for some time now on this new edition of ITIL. And, while we’re sworn to secrecy on the details, what we can say is that ITIL promises to be more relevant than it has ever been. In preparation for the update, AXELOS spent a lot of time seeking out the needs of the user community as well as the views of respected industry experts like Pink’s Troy DuMoulin. There have been thousands of people who provided input, and the research phase took well over a year. More recently, the documentation of the new guidance took almost another year, so this has clearly been a project with much effort and commitment. Hats off to all those who’ve contributed! And, we’re proud to say that the Integrated Service Management view we’ve incorporated into many of our recent courses, is the perfect match to ITIL 4. As usual, Pink is right in the thick of it! Since the very first ITIL book was published in 1988, we've been providing input, authoring books, developing courses and leading the way in that true Pink pioneering spirit! Over the years, NO OTHER organization has been as deeply entrenched and influential in ITIL as Pink. So you can trust us to continue helping where we can. Be amongst the first ON THE PLANET to be ITIL 4 educated and certified. In a few weeks, AXELOS will announce the official launch date. We will then publish Pink’s schedule of overviews and courses. In the meantime, sign up today! Space is limited, so if you’re interested let us know and we’ll put you on our wait list. We’re here to help you through the transition. Contact our Customer Service Team at 1-888-273-PINK or info@pinkelephant.com. Have a colleague who might find this information valuable? Forward them a copy! ...or watch Pink Elephant President David Ratcliffe tell all in his ITIL 4 webinar!